Bitcoin, also called a mobile currency or a crypto currency, was created in 2009 by Satoshi Nakamoto, a mysterious individual or a group of people whose true identity is still unknown today. The main idea behind the establishment of this virtual currency was to enable quick and cheap online payments without the need to use traditional banking channels. Bitcoin gained in popularity when its price jumped from around 572.33 U.S. dollars in August 2016 to approximately 4,764.87 U.S. dollars in August 2017. As of December 2017 this virtual currency was worth 13,860 U.S. dollars. 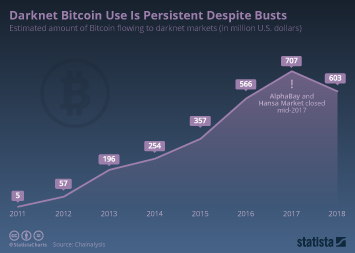 The market capitalization of Bitcoin also increased dramatically in that time, and reached a level of 237.62 billion U.S. dollars in Q4 2017. The number of Bitcoin ATMs increased from 954 in January 2016 to 2,053 by January 2018. Most Bitcoin ATMs, as of January 2018, were located in the United States and Canada. The Bitcoin ATMs located in Europe constituted 20.42 percent of the global ATM market share. The leading ATM producer worldwide as of January 2018 was Genesis Coin, with 36.01 percent of the market share. However, the future of this virtual currency is yet unknown. If the most important difficulties are overcome, especially those related with regulations on the cryptocurrency market, and people all over the world start to trust in Bitcoin, it might become one of the most popular online payment means. As of August 2017, roughly 40 percent of the Americans were willing to use Bitcoin for transactions and making purchases.